There are some pretty outstanding things about technology...but do you know one of the worst things about it? New technology only lasts a few years before it becomes outdated or obsolete. Take a cell phone. You get a brand new one with all of the bells and whistles. Sweet! By the time you finally adjust to the new features and learn about the many functions (like a year or two later), there’s already a newer version on the market that has twice as many capabilities. Of course your phone is just fine and still works, at least for the next year or so until your device is clearly outdated by the newer models. A website is not so different from a cell phone. There will always be fresher designs and updated versions. Find a website that’s 5 years old (maybe even just 3 years old) and you’ll be able to note a significant difference in visual aesthetics, layout and general design. Endless tabs, catchy banners and beveled buttons have been replaced with clean designs, bold color palettes, and noticeable visuals. There’s more than meets the eye because even elements like SSL certificates, mobile compatibility and the end of Flash have been modified. Feeling convicted that you website is a bit outdated? On the fence about splurging for an upgraded website? It’s time to renovate! 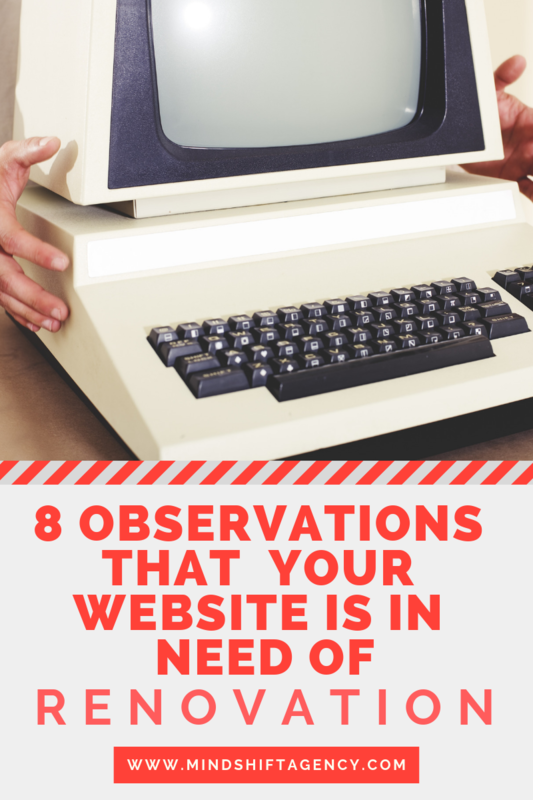 If you experience most of these 8 things, then you can be confident that your website needs to be renovated! 1: Your site look like it was created in 2000. This may be obvious but...if your website hasn’t been updated in the last 10 years, then it’s time for a renovation! Your top industry competitors likely have modern websites that are easy to navigate and attractive to customers. In the same way, remodeled office buildings are more customer-friendly than ones from the 1960s. 2: Your website hasn’t been updated in the past 3 years. Although your website may not look like it was created in 2000, you can be assured that technology has advanced in the past 3 years. For example, mobile compatibility doesn’t change the look of your site but it does enhance the users experience no matter which device they are on. That’s like offering your customers a wall plug that also has a USB port - it just shows that you’re aware of the latest trends. In order to glean the most potential from your website, make sure that it’s renovated to align with the latest designs and trends. 3: Your website is not mobile compatible or responsive design. I briefly mentioned this in point 2, but mobile compatibility is essential to any updated website. Most customers will view your website from a mobile phone or tablet, therefore your must renovate your site ASAP! A non-responsive design will repel customers like a dilapidated house. 4: Your website and current brand are not in alignment. Your brand has likely morphed and grown over time...has your website done the same? Remember that the first impressions of your site should portray a consistent message and brand to your audience. If those two things are out of whack, a website renovation is the best solution. 5: It’s tough to update content on your website. Have you had one too many headaches over trying to update content on an old platform? Say bye bye to those outdated difficulties. A welcome website renovation will make it as easy as 1-2-3 to post new blogs, add landing pages, or edit existing content. 6: Your website isn’t producing enough leads or conversions. This should be easy to discover: if your website isn’t producing the number of leads or conversions that you need, then your website needs a renovation. Thoroughly explore this list and comb through your website to understand the detailed reasons why your website is hindering your growth. 7: Your bounce rate is high (visitors only visit one page on your site). Bounce rate simply means how many visitors only visit one page on your website. They visit the page they land on and don’t look anywhere else. They either didn’t find what they were looking for, don’t have an interest to learn more, or found your website too difficult to navigate. A renovation can produce fresh designs that will alleviate these issues and encourage visitors to linger beyond one page. Not sure if your bounce rate is low, normal or high? If your website regularly has a bounce rate of 70-90%, a website renovation and updated content should be high on your priority list. 8: You don’t employ inbound marketing tactics. A genuine inbound website has content to attract visitors, offers multiple opportunities for lead conversion, and nurture clients along the marketing funnel. While a helpful website shares valuable information, your site could be doing so much more to enhance your marketing efforts! Don’t allow your website to be one of the reasons a lead goes with a competitor instead of you. Shift from boring content to inspirational wisdom. Change from an old-fashioned design to a easy-to-navigate website. Refresh the old stuff into modern and valuable. If you’re site is ready for demolition and renovation, we’re the perfect contractor and design team! We can gradually help you make those improvements over time, or we can do a quick and dirty overhaul. Contact us today so we can create grand plans for your website. We can’t wait to see the growth that results from a website renovation!